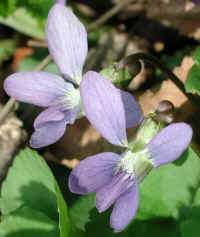 (Violet, Common (Viola papilionaceae) - 01) This common violet actually becomes quite exotic looking when viewed in this enlarged photo. (Violet, Common (Viola papilionaceae) - 02) This small patch of violets gives us the opportunity to view the leaf and flower structure. 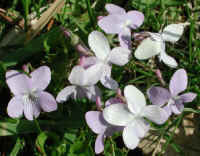 Note that the flowers rise on separate stems and not from a common stem with the leaves. (Violet, Common (Viola papilionaceae) - 03) Note the way the violet leaves "unroll" as they develop. 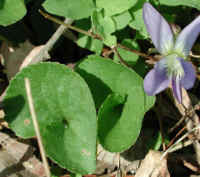 The leaf structure makes it relatively easy to identify the violet when it is not in bloom. (Violet, Common (Viola papilionaceae) - 04) Note the way the flower stems of the violet rise independently from the leaves. 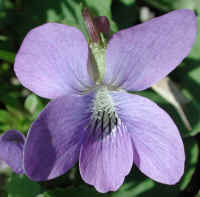 (Violet, Common (Viola papilionaceae) - 05) The flowers of the violet are said to be high in vitamin C and have been used to make a colorful and nutritious garnish on salads. It was also used for medicinal purposes by the early settlers, which we presume they learned to do from the Native Americans. (Violet, Common (Viola papilionaceae) - 06) We could not specifically identify this smaller and lighter blue variety of the common violet. 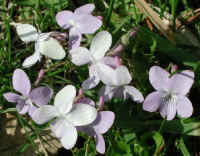 The flowers of this variety also seem to be more numerous, and the two upper flower petals overlap more than those of the larger variety in the earlier photos in this series.